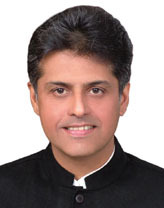 S.S.Pandey,LUDHIANA, March 6: Manish Tewari, the national spokesperson of the All India Congress Committee today criticized SAD-BJP government in the state for its failure to provide electricity to the people, particularly in the rural areas. He said, the government had virtually pushed the state into the darkness. Addressing a series of well attended public meetings in villages Hambran, Pandhori, Sidhwan, Mulapur, Partapsinghwala, Sidwan and Talwandi Khurd Tewari pointed out, it was for the first time in the history of the state that power cuts were introduced during the winters. “And these were not ordinary power cuts, as these lasted for six to nine hours”, he said, while adding, the way the government was going there was no hope of the power situation improving in the coming summer. Tewari said, the SAD-BJP government had reversed all the good policies of the previous Congress government led by Capt Amarinder Singh. He said, people across the state were surprised as why was the SAD-BJP government discouraging investment. He said, it is trying to reap the harvest of the projects started during the previous Congress regime. The AICC national spokesperson pointed out, this government had even failed the farmers and it was the Congress government at the centre which had provided massive hike in the Minimum Support Price of wheat and paddy. “This government has not been able to provide adequate power to the farmers what to speak of giving them other benefits”, Tewari said, while adding, the people were too disillusioned with the government and were waiting to teach this government a lesson. Prominent among those who addressed the meetings included Milkiat Singh Dakha, Darshan Singh Birmi, Manjit Singh Hambran, Manjit Singh Barowal, Major Singh Mullapur and others.